Hunter River High School is a comprehensive, co-educational secondary school with an enrolment of approximately 800 students, 20% of whom identify as Aboriginal and/or Torres Strait Islander. Our school is located on Worimi land, close to the Hunter River at Heatherbrae, south of Raymond Terrace. 'Quality Relationships - Quality Learning' is the motto that underpins our community's belief that quality educational outcomes are achieved when all partners in the educational process work collaboratively in a supportive, harmonious environment. Through high expectations and embedded Positive Behaviour for Learning (PBL) values of Harmony, Respect, Honesty and Success, the school provides a learning environment that aims to give each student the opportunity to reach their highest potential. 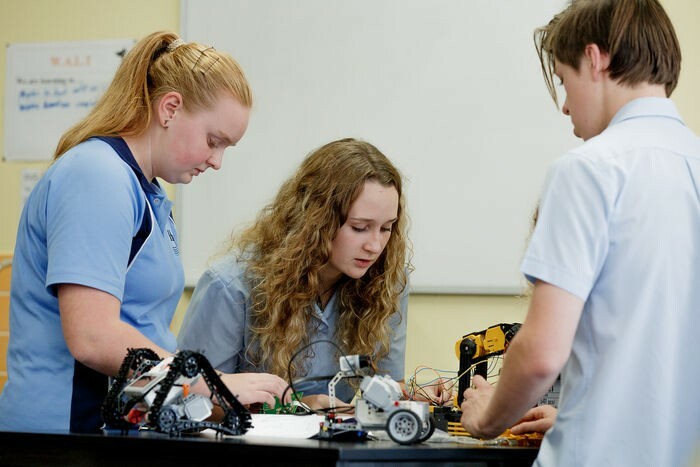 Hunter River High School offers an innovative curriculum that includes a full academic load plus significant programs, including a wide range of nationally accredited Vocational Education and Training (VET) opportunities. Hunter River High School is a P-TECH (Pathways in Technology) Pilot school, a leader in STEM education initiatives and provides extensive programs enhancing Aboriginal education, Literacy and Numeracy outcomes. The School has two mottos. The traditional motto appears on our school's crest and is the French word "Essayez", meaning "test yourself". This is reflected in our ongoing belief that none of us will ever know just how much we can achieve unless we are willing to push our own boundaries forward and try new things. More recently the school has adopted a second motto, "Quality Relationships - Quality Learning", because we believe that quality educational outcomes will be achieved when all partners in the educational process are working together in a supportive, harmonious environment. These beliefs are put into everyday practice through: our positive welfare structure and special whole-school programs which aim to create a warm, caring and safe environment; our commitment to whole school community participation in decision making; processes we have implemented to allow the staff to work together to improve student outcomes; the provision of programs which allow students, staff, parents and community members to work together to cater for the academic, sporting, cultural, social and vocational needs of our students; our commitment to developing positive links to the Aboriginal community; and the close involvement of parents of students with special needs in the implementation of quality programs.